If you are looking for an unusual and distinctive custom flooring option, it is hard to beat the beauty of an acid stained concrete finish (which is also commonly called acid washed concrete). Suitable for indoor and outdoor residential, commercial and industrial applications such as restaurants, museums or shops, acid stained concrete is popular for several reasons – it is a cost effective, low maintenance, attractive floor finish, and completely unique. Acid stained flooring is created by applying a solution of acid, water and inorganic chemicals to a cured concrete surface. Variations in the concrete’s porosity, density, and water retention creates the unique marbling effect and extraordinary hues in the finished concrete. An acid wash finish can be applied to virtually any concrete surface, from acid stained driveways to stained countertops, and patios including surfaces that have been in place for years. Due to the chemical makeup and content and variations in the surface texture, as well as ambient environmental conditions, each acid wash application is unique, and will look custom-designed. Acid stained finishes are durable, and resist damage such as chipping, cracking, staining or discoloration from materials being dropped or spilled. Once sealed, the finish is sturdy and forgiving for both living spaces and high foot-traffic areas. The Downsides of Acid Staining Concrete? Acid stained flooring has a unique aesthetic appeal, a low initial installation cost, is easy to clean, and is very low maintenance; however there is one negative about acid stained floors. If you are looking for a particular color or a very uniform design, acid stained concrete will not be the best choice for you, and you will likely be happier with one of our epoxy flooring designs. Staining is a fluid process so it is difficult to know in advance exactly how the staining will work with your concrete. 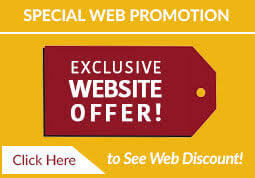 Each application is truly customized so you must be one of those who likes this modern and interesting look. Not sure about Stained Concrete is for you? If you are thinking about installing or beautifying your existing concrete surfaces, weigh your options and consider the benefits acid washed concrete has to offer. 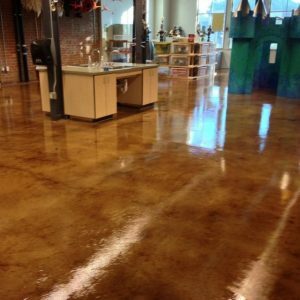 Contact Dreamcoat Flooring today at 480-226-4172 for a free design consultation and floor estimate to help you determine if an acid washed concrete application, or one of our beautiful epoxy flooring designs is better for your home or business.